USA Olympian and hometown hero Nico Hernandez and Hungarian flyweight champion Jozsef “Little Red” Ajtai took completely different paths into the professional ranks. Hernandez vs, Ajtai is the eight-round main event for the vacant International Boxing Association (IBA) Americas flyweight title fight, Saturday night, December 2, on the “KO Night Boxing: Gold & Glory” card, at Hartman Arena in Park City, Kansas. “KO Night Boxing: Gold & Glory” is a presentation of KO Night Boxing LLC., in association with Hartman Arena, and sponsored in part by Twister City Harley-Davidson Metro PCS, Mort’s Cigar Bar and Jimmy’s Egg. The action will be taped live for future airing on CBS Sports Network. The 21-year-old Hernandez (3-0, 2 KOs), fighting out of Wichita, was a decorated amateur boxer who compiled a sterling 123-12 record, highlighted by his bronze-medal winning performance at the 2016 Olympic Games in Brazil. Hernandez made his pro debut last March. All his fights have been at home, each has been in the main event, and on national television. His fight against Ajtai, however, will be his first title fight, coming in only his fourth pro bout. Ajtai, who is one year and six days younger than Hernandez, made his professional debut 2 ½ years ago, and he’s already fought in five title fights. Hernandez’ amateur pedigree versus Ajtai’s pro experience? 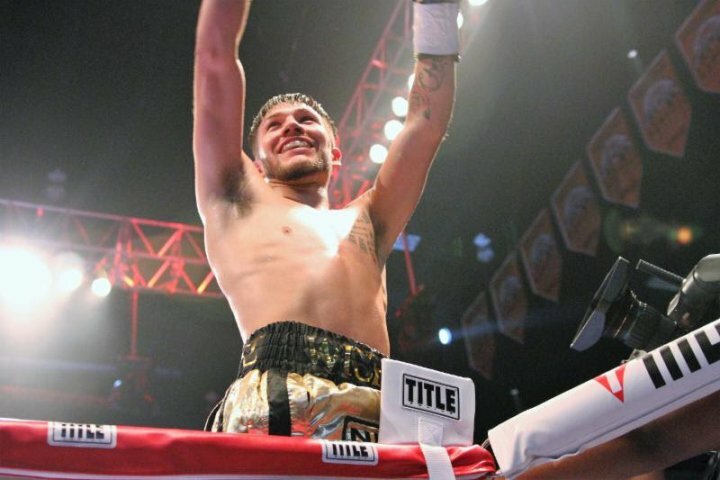 “I feel like I’m already at the level of a lot of top pro fighters,” Hernandez said. The only advantage he has is he’s used to fighting more rounds than I (this is Nico’s first scheduled 8-rounder), but I don’t plan on letting it go the distance anyways. Ajtai (19-9, 12 KOs) has already had 28 pro fights, including a full 10-round distance loss by decision last year at Madison Square Garden in New York City to two-time Olympic gold medalist Shiming Zou, the former World Boxing Organization (WBO) flyweight world champion. The Hungarian has fought at home in Hungary, as well as on the road in the United Kingdom, Spain, Germany, Ukraine and Slovakia. A trip to America’s heartland doesn’t faze him in the least. “He will be at home, where everybody wants to fight, but this isn’t a problem for me,” Ajtai explained. “I know he is a good boxer, but I will try to be a bit better December 2nd. When my condition is good, as it is for this fight, nobody likes to fight me. Hernandez realizes that this fight could be his last at home for a while, due to the lack of quality American flyweights, and that most world-class fighters in his weight class are from Central America, Thailand and Japan. “I don’t think I’ll have many more fights at home,” Hernandez admits. “I don’t think that will matter too much because I feel more pressure fighting at home than elsewhere. I will miss everyone cheering my name like they do at home. I think I’ll be traveling more to fight bigger names to work my way up the ladder until I’m at the top. Ajtai, of course, isn’t traveling all the way to Kansas to visit Dorothy or the Wizard of Oz, he’s coming to win! “Nico will not know where I will be in the ring,” Ajtai predicted. “When he looks to the left for me, I will go to the right; when he tries to find me on the right, I will be on the left. When he wants to rest, I will come forward punching; when he wants to punch, he won’t find me. The full “Gold & Glory” card will be announced later this week. All fights and fighters are subject to change. Tickets go on sale tomorrow (Tuesday, Oct. 24 @ 10 a.m. CT) at the Hartman Arena box office and http://www.ticketmaster.com/venue/50551?Brand=Hartman. Prices are $115.00 (VIP), $75.00, $50.00, $35.00, $25.00 and $20.00 (prices do not include service fees). Student tickets are available – kindergarten through college – for $15.00 dollars but are only sold at the arena. Student Identification is requited. This is an all-ages show. Doors open at 5:00 p.m. CT with the opening bout scheduled at 6:00 p.m. CT.